Geneva Seal's exclusive luxury watch brand HYT (Hydro-Mechanical Horologists) won the "Favourite Men's Watch" award at this years grandest luxury timepiece and jewellery showcase in Asia, A Journey Through Time. Celebrating it's eighth edition, the annual showcase has become iconic worldwide for bringing together the biggest and most prominent names in the watch and jewellery industry. "The HYT H1 Dracula is inspired by the most famous vampire of the classical literature, the Count Dracula. To fulfill the spirit of this novel written by Bram Stoker and the Gothic atmosphere that it shows, HYT has chosen a full-black DLC coating on the case, enliven by several bloody-red accents. 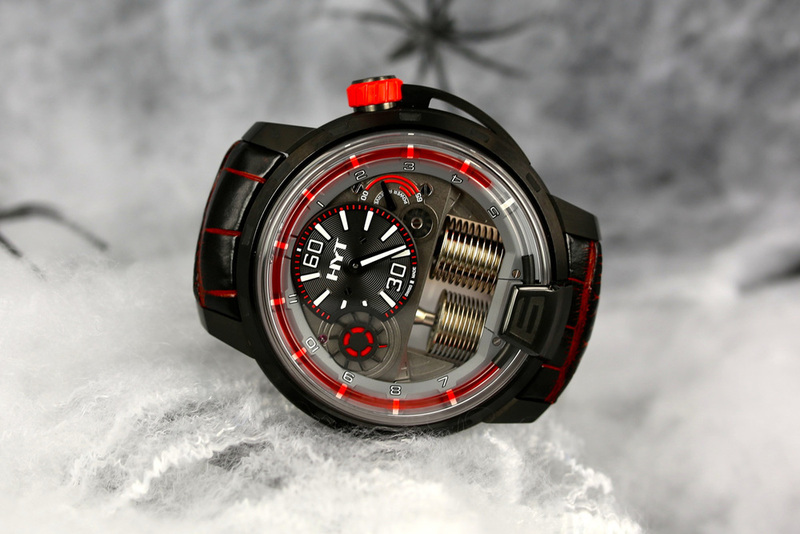 The fluid also shares that same colour, identical to the HYT H1 Red2. The dial uses that same monochromatic idea with a dark grey finish." "The bloody-red accents can be found on the second-wheel, the power-reserve indicator and the crown. The strap features a very cool black alligator leather with red veins. The movement is now coated in black too instead of a rhodium plated treatment on the other editions. We also note a little evolution of the central dial that shows the minutes, with bigger indexes, always coated with luminescent material. We can expect a better night-time legibility," explains Brice. Congratulations to all of this years winners, we can't wait until next year.